The following is a guest post by Rebecca Hughes, research associate for Women and Foreign Policy, and Kyle L. Evanoff, research associate for International Institutions and Global Governance, at the Council on Foreign Relations. Today is International Women’s Day. This day of recognition shines a spotlight on the achievements of women past and present. It was formally established in 1975, when the United Nations celebrated International Women’s Year and held the first World Conference on Women in Mexico City. However, the day’s origins can be traced back to the first decade of the twentieth century and the women’s labor and suffrage movements. All too often women and their stories are edited out of history. However, women have played critical roles in forging the contemporary world and the international institutions that help govern it. Thanks to women, we gained—among other fixtures—the Universal Declaration of Human Rights, the first treaty to articulate the fundamental human rights that should be universally protected. Eleanor Roosevelt steered the treaty through a tumultuous drafting and adoption process; Hansa Mehta, Minerva Bernardino, and Bodil Begtrup insisted upon inclusive language that referred to “humans” instead of “men”; and women such as Begum Shaista Ikramullah, Evdokia Uralova, and Marie-Helene Lefaucheux pushed for it to address women’s issues such as marriage and equal pay. Furthermore, women such as Hannah Arendt, Marie Colvin, and Elena Poniatowska have challenged us to understand the world in new ways. And in recent years Margaret Chan, Christine Lagarde, Angela Merkel, and Phumzile Mlambo-Ngcuka have changed the face of leadership. Today, in honor of International Women’s Day, we highlight just a few of the women whose contributions have helped to shape world order into its present form. Mabel Newcomer. Dr. Mabel Newcomer was a respected economist, passionate educator, and prolific writer. From 1917 to 1957, she taught economics at Vassar College, where she was known as the best “tax man” of those years. In addition to teaching, Newcomer served as the first female vice president of the American Economic Association and as a consultant to the U.S. Treasury. In 1944, she represented the United States at the UN Monetary and Financial Conference at Bretton Woods. She was the only American woman at the conference that would establish the International Monetary Fund (IMF) and the International Bank for Reconstruction and Development, later to grow into the World Bank. At the meetings on the IMF, Newcomer was the only woman at the table, though not the only woman in the room. The other women present sat behind male delegates as expert consultants. After the conference, Newcomer helped sell the program to American women, and traveled throughout the country speaking to many groups, contributing to the success of the institutions that have been essential in managing the world economy. Doris Stevens. Doris Stevens was a champion for women’s rights both at home and abroad. Stevens was a prominent organizer and leader within the American suffrage movement. Though she was arrested multiple times, she remained committed to her cause. In 1922, the suffragists secured the 19th Amendment to the U.S. Constitution, and Stevens turned her attention to international women’s rights and legal status. She was appointed as the inaugural chair of the Inter-American Commission of Women (IACW), the first intergovernmental agency established to ensure recognition of women’s human rights. During her tenure, the IACW meticulously documented how laws around the world codified gender inequality. In 1933, this work yielded the Convention on the Nationality of Women, which was the first international instrument adopted concerning the rights of women. The treaty ensured a woman’s right to retain her own nationality in the event of marriage to a man of another nationality. Decades later, women around the world continue her fight for legal equality. Gro Harlem Brundtland. Beyond becoming the first woman and youngest individual to hold the office of Norwegian prime minister, Dr. Gro Harlem Brundtland played an essential role in popularizing the idea of sustainable development. In 1983, the UN General Assembly established the World Commission on Environment and Development and mandated it, among other items, “to propose long-term environmental strategies for achieving sustainable development to the year 2000 and beyond.” Brundtland chaired this commission and oversaw the three years of deliberations that produced its seminal report, Our Common Future [PDF]. The findings of the Brundtland Report, as it came to be known, have served as a foundation for much of the United Nations’ subsequent work on environment and development, including the 1992 Rio Earth Summit and, more recently, the 2030 Sustainable Development Goals. The concept of sustainable development articulated in its pages has gained currency well beyond the halls of multilateral institutions, becoming a twenty-first century global social, cultural, economic, and political touchstone. Ngozi Okonjo-Iweala. While some international institutions, like the Brundtland Commission, have had women at their helm, others have proved more recalcitrant to female leaders. One such institution, the World Bank, saw cracks in its glass ceiling in 2012, when Dr. Ngozi Okonjo-Iweala ran to become its president. 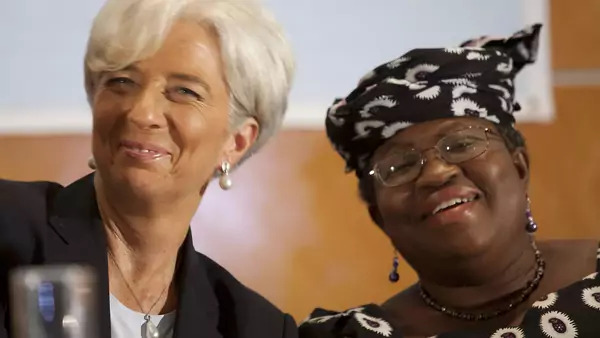 After serving terms as Nigeria’s foreign affairs minister and finance minister, and then as a managing director at the bank, she (and Colombia’s Jose Antonio Ocampo) squared off against American physician Jim Yong Kim in the bank’s first-ever contested presidential selection. Historically, a longstanding transatlantic gentlemen’s agreement has put an American in charge of the bank and a European in charge of the IMF as a fait accompli. Okonjo-Iweala helped to challenge that non-meritocratic status quo with her candidacy. Although unsuccessful, she put up fierce opposition and laid the groundwork for future challenges from non-Americans, especially from developing countries. With the World Bank presidency now up for grabs once again and the controversial David Malpass as the U.S. nominee, Okonjo-Iweala has garnered attention as a potential alternative. As the current chair of the board of Gavi, the Vaccine Alliance, and an influential figure on the world stage, she will remain an inspiration for women across the globe regardless of whether she assumes the mantle of World Bank president. Jody Williams. For decades, Jody Williams has been one of the world’s most effective peace advocates. In 1997, Williams and the International Coalition to Ban Landmines (ICBL) jointly received the Nobel Peace Prize for their work to ban landmines. Williams was first exposed to landmines’ devastation during her work in El Salvador in the 1980s. As an aid worker, she was responsible for providing prosthetic arms and legs to children who had lost limbs to mines. She returned to the United States, and in 1991 began working with ICBL as its chief strategist and spokesperson. Williams was a triple threat: she had a flair for activsim, was an effective organizer, and did not mind if people found her difficult. Within six years, she had grown the coalition to some 1,300 organizations across ninety-five countries. In December 1997, ICBL achieved a major victory when world leaders gathered in Ottawa, Canada, to sign the Mine Ban Treaty, which bans the production, use, stockpiling or transport of antipersonnel mines. Although these weapons still exist, the treaty contributed to a strong norm against their use. Ever the activist, Williams continues to work toward peace. In addition to her work with the Campaign to Stop Killer Robots, she co-chairs the Nobel Women’s Initiative, and has joined with fellow survivors of sexual assault in lobbying world leaders to end sexual violence in conflict. Lise Meitner. Science, alongside politics, is one of the most powerful forces shaping the modern world. Dr. Lise Meitner, a prolific and pathbreaking Austrian physicist, had a profound influence on both. She was a critical member of the team that first unlocked the potential of the atom, a structure central to international politics since World War II. After her colleague Otto Hahn’s bombardment of uranium with neutrons in 1938 yielded barium isotopes, Meitner correctly inferred that the splitting of the atomic nucleus—nuclear fission—was responsible. She and her nephew Otto Frisch articulated the process through which this occurred, leading scientists to surmise that a fissile chain reaction would release enormous amounts of energy, generating an explosion of immense power. Although Meitner, who had fled to Sweden due to her Jewish lineage, had made a contribution integral to the development of the atomic bomb, she refused to participate in the subsequent Manhattan Project. The Nobel Committee overlooked her several years later, when it awarded the 1944 Nobel Prize in Chemistry to Otto Hahn “for his discovery of the fission of heavy nuclei.” Meitner’s personal legacy, then, is one of profound humanity, having escaped the atrocities of Nazi Europe and abstained from the making of the bomb only to see her genius employed toward the destruction of Hiroshima and Nagasaki and bring the world to the knife’s edge during the Cold War. The women highlighted here represent only a small proportion of the women who have worked across borders to build a more peaceful, prosperous, and equal world. Their already challenging work was made even more daunting by the barriers—legal, economic, and social—that they had to overcome in order to do their work. Today, in addition to honoring these women and their achievements, we should take a clear-eyed look at the barriers that remain intact and double-down on efforts to dismantle them. A generation of young women waits to engage in the hard work of changing the world, and it is our responsibility to make it easier for them to do so.